Filipino Investor: What Happens to Equities and Bond Prices When There is a Sudden "Spike" in Interest Rates? What Happens to Equities and Bond Prices When There is a Sudden "Spike" in Interest Rates? "Goldman Sachs Group Inc. Chief Executive Officer Lloyd C. Blankfein warned that the interest- rate environment has parallels to 1994, when a sudden and sharp increase in rates caught many investors off-guard." Question: What happens to Equities and Bond prices when there is a sudden hike in interest rates? Methodology: We've examined the 10Y US Goverment Yields, S&P 500 Index and US Long Bond from 1981 to Present (32 years) and tried to find out what happens to Equity prices and Bond prices when interest rates make a sudden move up a.k.a "Interest rate spikes". We've identified 5 interest rate spikes between the 32Yperiod. 3. 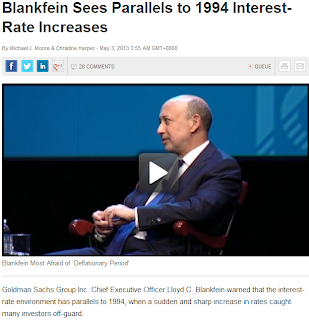 Oct 1993 to Dec 1994 <-- Lloyd Blankfein's "1994"
5. Jan 2009 to Jun 2009 <-- This spike is not really as huge as the prior 4 but we've included for us to have a more recent event. Let's find out what happens to SPX and US1 when these 5 identified Interest rate spikes happened. Though it is evident that the 30Y downtrend in Interest Rates (IR) from around 15% in 1982 to only 1.62% at present is clearly beneficial to the Stock market as Corporations are able to fund their businesses with cheap credit, hence the generally increasing trend in the SPX Index. Surprisingly, IR Spikes in between did not necessarily have an opposite reaction to the SPX, infact on the 5 spikes identified, 3 of them resulted to an even higher level of the SPX, 2 of w/c prices just moved sideways. We found this really interesting as this seem to be very counter-intuitive since we would generally tend to think that due to the very low interest rates a sudden spike could lead to a Stock market sell-off. Though this is still possible, our 32Y back testing study tells us otherwise or that this does not necessarily happen. What is sure to move opposite the Interest Rates however is the bond prices. Every time the USGG10YR Index goes up, US Long Bond prices would always go Down and vice versa. Hence what we could conclude in this study is that if we think that the Interest Rate is going to go up - in line with Lloyd Blankfein's "biggest worry" either through an IR Spike or a complete reversal of trend (from downtrend to uptrend), to make money on this move, shorting the S&P 500 is not the way to go - what we should do is short the US Long bond or US1 Comdty instead.